Join Turning the Tide 2017! 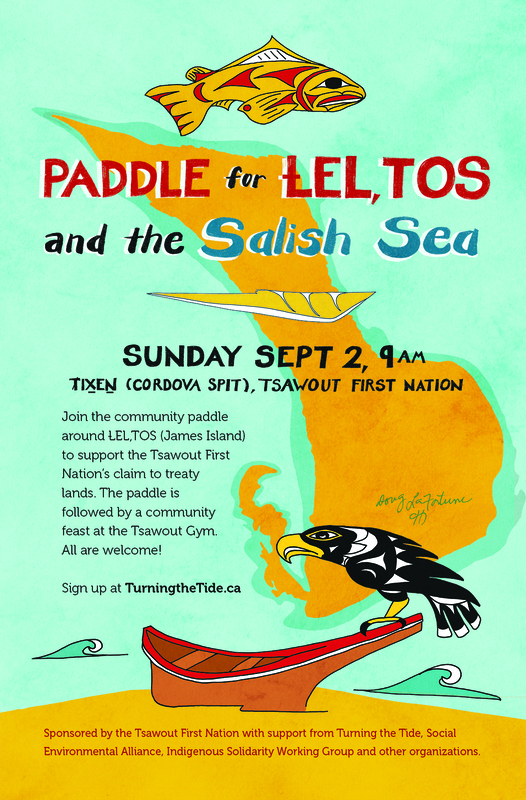 This year’s 4th Annual Turning the Tide: Peoples’ Paddle for the Salish Sea promises to be another exciting and meaningful family-friendly journey, uniting people from across the Salish Sea in community and solidarity for people and the planet. The Paddle will take place over five days and four nights, from August 9-13, 2017, beginning at Swartz Bay on Vancouver Island and proceeding to Salt Spring and Pender Islands for special cultural, recreational and educational programming. Camping and dinners have been arranged for paddlers on all islands, and are included in the participant fee of $95 per person over 15 years (subsidies available, please contact us, and consider donating an extra $20 with your fee to help fund a fellow paddler). This year’s theme is “Solidarity Across the Salish Sea.” With the federal government’s recent approval of the Trans-Mountain pipeline expansion project, and the election of one of the most regressive presidents in American history, our movements need to strengthen and grow. Now more than ever, we need to stand up and build a culture of solidarity and resistance on both sides of the border. You can learn more by reading the Turning the Tide 2017 Participant Package and then complete the Registration Form here. If you have additional capacity in your boat or would like to request a spot in a boat, please let us know and we will endeavour to help match you up. Discounted canoe and kayak rentals from several agencies are also available. We look forward to paddling with you this summer as we demonstrate our love for the Salish Sea — and build our on-the-water and inter-islands community of solidarity for people and the planet! Thanks for setting this up. Really looking forward to doing it again.